There was plenty of offseason hype surrounding junior quarterback McKenzie Milton, and rightfully so given the great year he had in 2017. While he largely backed up that hype against UConn, Milton looked awful for much of the first half against SC State. He threw three interceptions in the first half, after only throwing nine all of last season. His passes also often missed the mark throughout the first half, including a couple plays where the ball landed nowhere near a receiver or floated out of bounds. He went into halftime with just 130 yards on 10-for-23 passing. He didn’t throw a touchdown pass in the first half. While Milton struggled throughout the half, junior running back Adrian Killins looked excellent. He broke out for several big runs in the first half, as the defense struggled to contain him early on. He rushed for 87 yards in the first half on just seven attempts, and scored two touchdowns. Killins was a bright spot in what was an otherwise unimpressive offensive performance for the Knights. 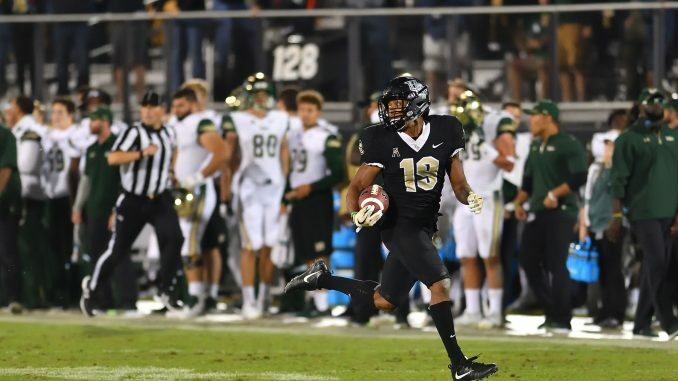 Despite scoring 24 points, UCF looked far from dominant on many of its offensive plays. Attendance was often an issue last year, but that wasn’t the case as the Knights played their first home game in front of a nearly sold out crowd. Both student sections were packed almost 30 minutes before the game started and the stadium filled out nicely early in the first quarter. Last season, UCF only broke 40,000 in attendance twice and had two games where less than 30,000 fans showed up. It’s looking like this season may be shaping up differently. Official attendance stats will be announced during the second half.